Wednesday 16 July 1941 could have been a disastrous day for the Organisation in Marseille. That was the day French police arrested Elisabeth Haden-Guest and Adolphe Lecompte after they called on Room 530 at the Noailles Hotel. Also arrested at the Noailles over the next few days were Francis Blanchain, Mario Prassinos, Frank Viner, Jean Fourcade, Nadia Pastre, Paul Dubar and Jan Jankowski. Today the Berengier designed Hotel de Noailles is an office block, but in 1941 it was the particularly fashionable and luxurious hotel on the Canabière where Tom Kenny stayed. Tom Kenny isn't mentioned much in the literature about the PAO, but when his name is included, he is usually described as a Canadian businessman, sometimes as a friend of Ian Garrow, and best remembered for falling in love with and marrying the young 'Sue' Martinez. Tom was certainly Canadian but exactly what his business in France was at the beginning of the war is not clear. Early in 1940, during the so-called 'phoney war', Tom was apparently on holiday in the south of France. Tom already knew Nancy, the twenty-seven year old New Zealand-born journalist who had married French industrialist Henri Fiocca the previous year. The Fioccas lived in Marseille and much of Nancy's free time was spent at the bar of the Hotel du Louvre et de la Paix on the Canabière, where she and Henri were friends with the general manager, André Digard. It was André who introduced them to his sister Emma and her daughter Micheline from Cannes. Nancy and Micheline Digard became friends and it was Nancy that brought the teenage Michette back from her studies in England after war was declared. It was also at the Louvre et Paix that Nancy introduced Emma and Micheline to Tom Kenny. Tom soon fell in love with Micheline - aka Suzanne Martinez. Sadly, the luxurious Pot designed Hotel du Louvre et de la Paix at 49 Canabière is no longer a hotel either. In July 1941 it had 250 rooms, 20 salons and two restaurants but it was requisitioned by the French Navy later that year and subsequently occupied by the German Kriegsmarine. In 1980 the building was sold and completely refurbished. It reopened as a C&A store in 1984 and today it's another office building. The Kennys had emigrated to Canada from Ireland in the 1820's and became very successful businessmen. Tom was the first son of Lt Colonel Edward George Kenny of the Canadian 66th Princess Louise Fusiliers, Halifax NS and Gertrude McParland of Kingston, Ontario. Lt Col E G Kenny was the first son of Thomas Edward Kenny, first President of the Royal Bank of Canada (the Merchants' Bank of Halifax until 1902) from 1870 to 1908. The RBC headquarters moved from Halifax to Montreal in 1907. Thomas Edward James Kenny was born 26 April 1910 in Halifax, Nova Scotia. Tom's father died the following year and his mother later married an Irishman, Major Edward Knox-Leet. Tom was brought up in Canada and went to boarding school at Beaumont, Old Windsor, but when his mother, sister and step-father moved to Europe, Tom took his summer holidays with them on the French Riviera. In 1932, Tom was studying architecture in Belgium - he was registered (as an Englishman from Halifax) as living at St-Gilles-lez-Bruxelles. It is possible that he already had links to the British Intelligence Service - his uncle, Captain Patrick William Kenny, worked close to Sir Vernon Kell in the fledgling MO5 (created in 1909, became MI5 in 1916) from before the First War. It may also be worth noting that Tom's half-brother, Desmond Knox-Leet, after spending many months in the Royal Navy in Gibraltar, became a war-time translator at Bletchley Park. In a 1948 statement, Kenny says that in November 1940, he was charged (he does not say by whom) along with Captains Garrow and Wilkins, with organising "un réseau de renseignements [information or intelligence] et d'evasion" which later became the "Reseau PAT". At first, he says, this reseau was largely financed by the English who lived on the Cote d'Azur. The first 'published' mention I have of Tom Kenny is from Captain Leslie Wilkins in his 1941 MI9 report when he says he withdrew his parole at Fort St Jean in December 1940 and took up quarters in Marseille to "continue his work with Capt Murchie, Capt Garrow and Mr Kenny". Louis Nouveau, writing in his 1958 book "Des Capitaines par Milliers" says he first met Ian Garrow, James Langley and Tom Kenny that same month. Elisabeth (Lisa) Haden-Guest, who arrived in Marseille in February 1941, claimed in her 1993 book 'Dream Weaver' (which acknowledges both Louis Nouveau and Helen Long as sources) that Garrow and Kenny had organised a secret escape route for British servicemen and wanted her to join them. She describes Tom Kenny as a "blond (sic) attractive Canadian who spoke perfect French and was in love with the seventeen year old daughter of the owner of the Hotel Martinez in Cannes. Garrow and Kenny often used that hotel, and the escape network owes a lot to the Martinez family". She repeated in a letter in 1994 that "Garrow started it all with Kenny and that they needed a bilingual girl ... while Kenny organised the guides". The next published mention is from Lt Richard Broad's MI9 report where he details a meeting in mid-February with "Donald Caskie, Ian Garrow (who acted as liaison between Ste Marthe prison, where Broad's men were held, and the American Consul), Capt L A Wilkins, Tom Kenny, an officer (sic) named Illingworth and Capt Murchie, who acted as their chief." On 15 August 1941, Charles Murchie wrote from his Barcelona prison cell at the Castillo Montjuic, to Sir Samuel Hoare, the British Ambassador in Madrid, and said that "From about February I was joined by Captain Garrow and one Kenney [sic] (a Canadian) to whom I left the whole business of sending people through Spain ..."
Historic Note: Captains Charles Murchie and Ian Garrow, although often working together, had quite separate circles of contacts in Marseille, so that many who worked with one man seemed quite unaware of the other. Claiming either man to be chief of the Organisation in the winter of 1940/41 is both misleading and inaccurate. Richard Broad's story is told in William Moore's book 'The Long Way Round' and although it doesn't mention this meeting, it does describe Tom Kenny on page 141 as "another fugitive officer [who] had managed to obtain cash [for the escape organisation] from a friend in Cannes". That would be Emmanuel Martinez, his future father-in-law. Tom's name appears several times in Helen Long's 1985 book 'Safe Houses are Dangerous'. Although the book describes Tom as (financially) generous to the budding escape line, and a good and enthusiastic supporter of Ian Garrow, it goes on to say that he was nevertheless naïve and had no experience of clandestine activities. Helen presumably took much of her information on Tom from Elisabeth Haden-Guest, who seems to have believed what she was told by the French police about Tom following the arrests at the Noailles. However, as Elisabeth says herself, they were all interrogated separately and so she couldn't have known first-hand what Tom said. On 29 April 1941 Tom Kenny and Micheline Digard were engaged to be married. On 26 May 1941 Tom Kenny made a highly detailed technical sketch of the docks at St Nazaire. I also have a copy of an undated but equally detailed map of an unknown German airfield, annotated T E Kenny. The neat style of the drawings reflects Tom's architectural training, and the apparent numbering system suggests these are just some of many. Mere possession of such documents during war-time would have been enough to warrant arrest as a spy. F/Lt F W Higginson's MI9 report also mentions Tom Kenny. Higginson had been shot down near Dunkirk 17 June 1941 and quickly put in touch with the northern Organisation. He was sheltered overnight by Desiré Didry at his home at St Omer before being taken to stay with Mr Paul at La Madeleine on the outskirts of Lille. 'Mr Paul' was Sgt Harold 'Paul' Cole - aka Paul Delobel. On 29 June, Paul and Higginson took the train to Abbeville where the Abbé Carpentier provided papers for them to cross the Somme from the Zone Rouge to the Zone Occupée. They went on to Paris that night. Two days later they continued to Tours and crossed the demarcation line at St Martin-le-Beau before catching a train to Marseille, arriving 2 July. Higginson stayed with Dr Georges Rodocanachi and it was in his apartment that Higginson met Ian Garrow, Pat O'Leary, Bruce Dowding, Elisabeth Haden-Guest, Nancy Fiocca and Tom Kenny. He claims to have been present when they heard the "Adolphe droit rester" radio message from London, meaning that O'Leary should stay on with the Organisation in Marseille. On 4 July, Tom took Higginson south to Perpignan where they stayed at the Hotel Regina waiting to make contact with a guide to take Higginson across the Pyrenees. Tom combined this trip with a visit to Michael Pareyre to collect 45,000 francs, sent for the Organisation from Gibraltar. On Tuesday 15 July 1941, Tom married Suzanne Martinez in Cannes. Sue is referred to as Micheline Digard in Russell Braddon's 1956 book 'Nancy Wake' and the truth is a little complicated. Micheline is called Sue Martinez by most English writers but she was Micheline until her marriage. She is the daughter of Emmanuel Michele Martinez, founder and owner of the fabulous Hotel Martinez on the Boulevard de la Croisette in Cannes. Martinez was an Italian married to Marie Maldiney but in 1919 he had met and fallen in love with Emma Digard. As a catholic - and Italian - Martinez could not get a divorce and it was Emma who was seventeen year old Suzanne's adopted mother. Next day the French police sprung their trap at the Hotel Noailles in an attempt to capture Ian Garrow. It's not clear where Garrow was living at this time. Various sources give either 13 rue des Phoceens, the same address as Nancy Fiocca, or the Hotel Paris-Nice with Elisabeth Haden-Guest but he is also said to have shared a room at the Rodocanachi apartment with O'Leary. Elisabeth Haden-Guest always maintained that the police had been tipped off about Room 530 at the Noailles. She says that one of the French policemen told her that they had been betrayed by "one of their own" and she insisted that Harold Cole has to have been the man responsible. I think she is wrong. A more likely explanation, assuming any Briton was involved, is that the information came from the Seamens' Mission on rue Forbin where the meetings at the Noailles were common knowledge. Most accounts of the arrests say that Tom Kenny was also arrested at the Noailles. In fact he was still in Cannes with his new wife and was arrested on the terrace of the Martinez Hotel on Friday morning. Tom was arrested because, in addition to his own Room 505, where he had been staying before his wedding, Room 530 was reserved in his name. Room 530 was a regular meeting place for the Organisation and on that Wednesday Elisabeth arrived first and then Adolphe Lecompte (or Leconte). Shortly after Lecompte reached the room, the telephone rang. Elisabeth answered it and told Lecompte there was a message for her downstairs. When she failed to return, Lecompte (Pat O'Leary) realised there was a problem and left himself. He, like Elisabeth, was arrested. There is no account of the arrests by O'Leary himself and so most of the information comes from accounts by Elisabeth Haden-Guest. She admits that the details are largely assembled from things she heard later rather than first-hand knowledge. Note that O'Leary had been trained by the Security Services in England and had only recently escaped from the Fort du St Hippolyte. Having been in Marseille just a few weeks, he wasn't known to the local authorities. Elisabeth says she was with O'Leary in the hotel room when the receptionist phoned to say there were two men downstairs who wanted to see her. When she went down, two Sûreté inspectors took her to their headquarters at the Évêché. Later that day O'Leary was brought in. When Elisabeth had failed to return, he had assumed there was a problem, taken an empty suitcase from the room and walked out of the building - he was arrested, as Adolphe Lecompte, in front of the hotel. Elisabeth told the police that she had only recently met Lecompte in the Café Gaulois and that he had approached her when he heard her speaking English. Lecompte's story was that he was an ex-soldier who had come down from the north [his papers were supplied by Cole as issued in Lille, and O'Leary had a Belgian accent] and as a good Frenchman, was hoping to be able to join De Gaulle's forces. When he realised the police were pro-Vichy, he changed his story to say he was simply looking for work. Adolphe Lecompte was released a few days later. NB. Jean Fourcade says they called the otherwise unidentified police station the Évêché because it was near the cathedral. Later that afternoon Francis Blanchain was brought in. Elisabeth says none of them knew Blanchain but his story was that he had come to the Noailles looking for Tom Kenny to see if he knew of a way out of France, as he wanted to go to America. When told that Kenny wasn't at the hotel, he had left a message for him. Because Blanchain had a British birth certificate but French ID Card and demobilisation papers, the police held him for some months. Twenty-eight year old Francis Blanchain was born in England of French parents and held dual nationalities. Known as 'Achille', he was later involved in several PAO operations, including the escapes of Airey Neave and Whitney Straight, before being evacuated from France on the felucca Seawolf in September 1942. He is described by Neave as "a young, dark, strongly built man ... with an air of quiet determination and a certain aloofness". The following day Elisabeth was questioned and the only thing the police really wanted to know was the whereabouts of Ian Garrow. It would seem that while the police could turn a blind eye to French citizens working in the business of getting Allied servicemen out of France, they were less tolerant of foreigners being involved. Garrow was the current and very prominent leader of the organisation in Marseille, and the French wanted him. Elisabeth was also a high profile foreigner - in France she claimed to be English but was born in East Prussia in 1910 as Louise Ruth Wolpert. She grew up in a rich family and was living in Berlin in 1924 when she adopted the name Elisabeth after meeting the Austrian actress Elisabeth Bergner. She had a complicated life (see 'Dream Weaver' for details) and in 1939 married American ballet dancer and choreographer Peter Haden-Guest - she had their four year old son Anthony with her in Marseille. That same day (Thursday) Mario Prassinos was brought into the Évêché police station. Mario was already major player in the Organisation and had just returned from Perpignan with money for the group, which he intended to hand over at the Noailles. His story was that he had gone to see Kenny to congratulate him on his marriage to Sue Martinez. He told the police the money was his own and that he didn't know anyone in the escape business. He was released next day and promptly reported the arrests to Louis Nouveau. Airey Neave met Prassinos at the Nouveau apartment in 1942 and says the short, middle-aged Mario was wearing "the smartest business clothes ... like a character from some pre-war film set on the French Riviera". Next to be brought in was Frank Winer. Winer (or Weiner) was a thirty-one year old Czech 'journalist' who, at the time of his arrest, was living with Stella Lonsdale at the Hotel Scribe, 93 rue de Rome. Stella was another strange character on the fringes of the Organisation who later travelled to England where she spent most of the war in prison as a suspected enemy agent. Winer had tried to join Garrow in the apparent belief that Garrow worked for the British SIS. Garrow didn't trust either him or Stella and tried to keep both at arm's length. Winer was held overnight and then released, he says, by the French Special Police, who treated him leniently because of their pro-Ally sympathies. Winer left Marseille on 28 July and made his way to Gibraltar (via Miranda del Ebro) where he was interviewed on 2 October 1941. Jean Fourcade was also arrested at the Noailles when he came looking for Elisabeth. Fourcade was young Anthony's unofficial guardian and had been planning to take Anthony on holiday with him. In recent (2002) communications with Christopher Long, Fourcade says he had done some occasional work with Garrow on the escape line but this meeting was purely innocent. Again he was soon released and says he lost contact with the group after this episode. Incidentally, Fourcade refers to Tom Kenny as Lt Johnson - this is the only mention of such a pseudonym I have seen anywhere. Then Paul Dubart was brought in. Dubart worked with the Organisation in the north and had come down from Lille to meet with the Marseille group. His story was that some English people in Lille had asked him to go to the Seamens' Mission and find the padre (Donald Caskie) but the Mission was closed. A woman there had told him that if he wanted to meet some English people, he should go to the Noailles and ask for Mr Kenny. Jean Fourcade also says that a Polish Captain named Jan Jankowski (Marian Poray-Jankowski) was arrested at the Noailles but I have no further information about him. Conditions at the Évêché were such that prisoners' meals were taken at a nearby café. Elisabeth says she was having coffee on Friday evening when she saw Tom sitting there too. She says she told Tom that she hadn't said a word to the police and asked him not to say anything either. Elisabeth is then rather disparaging about Tom Kenny, saying she was subsequently asked questions on subjects only Kenny could have revealed. She also suggests Tom may have talked about the Organisation to his mother-in-law, Emma Digard, and that she had passed this on to the police, presumably in an effort to get Tom released for his co-operation, but this was all speculation on Elisabeth's part. Suzanne could not visit Tom after his arrest because, as an Briton by marriage, she was now under résidence obligatoire and restricted to Cannes. Two days after Tom's arrest and having had no news, it was Emma that went to Marseille to find out what had happened to Tom. She spent several days with Tom at the Évêché before he was sent to Fort St Nicolas. Elisabeth Haden-Guest didn't know Emma Digard - if she had then she would have realised just what a tough lady Emma really was. Even before she met Emmanuel Martinez, she was a wealthy and very independent woman. Emma also had many contacts in Marseille, and since she was particularly fond of her new son-in-law Tommy, she used those contacts to see what they could do to speed up the ponderous judicial system. One thing she did discover, through a friend of her brother André, was Capitaine Dutour's preferences at a certain brothel. Once she mentioned to Dutour that she knew the Madame there, they had an understanding. Within a few days everyone except Tom, Elisabeth and Francis Blanchain had been released. Tom and Francis Blanchain were taken to the military prison at Fort St Nicolas and Elisabeth to the civilian women's prison of Les Presentines. The three were held 'au secret' and unable to contact the outside world until 11 August, when they were all brought before a Military Tribunal where Capitaine Dutour was the Officer in Charge. Gaston Defferre had been appointed as Tom and Elisabeth's (and I think Blanchain's) defence lawyer and from this time on, they passed messages via the lawyer or his secretary Ginette Kahn. Defferre also exchanged letters with Emma Digard and Sue Kenny. Elisabeth says that Tom told her that the charges of espionage had been dropped and that they were to be tried on matters relating to the escape line instead. It was Emmanuel Martinez who arranged to have Gaston Defferre, Avocat au Barreau of 79 rue Montgrand, act as Tom's defence council, and Martinez who paid the lawyer's bill. Defferre, an active socialist who twice became mayor of Marseille after the war, as well as a member of parliament and government minister, was also a friend of the Rodocanachi and Zarifi families. As she left the Tribunal, Elisabeth says she was called to Dutour's office where she found Ian Garrow. She was then shown Garrow's statement which admitted that he was the head of an escape organisation and that Tom and Elisabeth had been helping him get British soldiers out of the Occupied Zone. When they reached the Free Zone, the soldiers were given their pay and encouraged to go to Fort St Hippolyte - the French internment camp where Allied military personnel were currently being held. Captain Ian Grant Garrow was arrested on 10 October after visiting Elisabeth at Les Presentines. It is believed that Sûreté agents from Vichy were responsible for the arrest rather than the Marseille police, who had allowed Garrow to visit Elisabeth on several occasions without detaining him. At this point Patrick Albert O'Leary took charge of the escape line which later came to bear his name, or (equally fictitious) initials. The real reasons for Garrow's arrest are not clear. It was probably the belief that, in addition to helping evading soldiers from the north, Garrow was engaged in intelligence gathering - this would have been a far more serious charge to the anglophobe Vichy French authorities. Elisabeth has suggested that this idea was reinforced by their dealings with Stella Lonsdale, who had accompanied Garrow on some of his visits to Elisabeth after her arrest. Garrow was held for three months at Fort St Nicolas before transfer to Mauzac concentration camp on the Dordogne river near Bergerac. He was brought to trial on 22 May 1942 and sentenced to three years imprisonment with six months solitary confinement. In early December 1942, Garrow was rescued from Mauzac in a complicated operation by the PAO. He was taken into Spain via Françoise Dissard in Toulouse at the end of January and flown back to England on 7 February 1943. Tom Kenny was released from Fort St Nicolas on 24 November 1941 after all charges against him were dropped. Elisabeth Haden-Guest was released from Les Presentines on 27 November 1941. She and Anthony soon left the country and celebrated the New Year in Lisbon. Whether the release of Elisabeth and Tom (and Francis Blanchain) were a result of, or at least expedited by, the diplomatic communications between the American, British and Canadian Consular authorities cannot be ascertained. Certainly they came to the attention of people in high places through Lisa's marriage to a prominent American and Tom's family connections to the US Roosevelt family - Tom's late father had been a cousin of Theodore Roosevelt. Tom's uncle in Montreal, Joseph B Kenny, also received personal updates of Tom's situation from Ottowa, forwarded from the Canadian Legation in Washington. 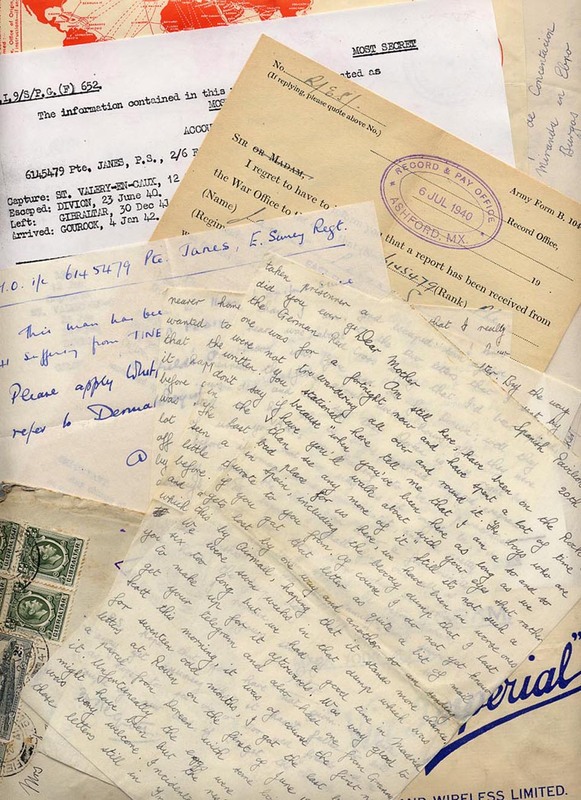 There may also have been interest from the British Intelligence Services - in 1943 Tom received news that Sue had reached Gibraltar in a personal letter from Maurice Buckmaster, Head of F Section SOE. On 25 Feb 1942 an Emergency Certificate was issued for Mrs Suzanne Kenny, British subject by marriage, born Paris 29 April 1923, wife of Thomas Edward James Kenny born Halifax, Nova Scotia 26 April 1910. It was issued by the American Consulate in Marseille and signed by Harry M Donaldson, Vice-Consul USA, in charge of British interests, Marseille. Despite all charges being dropped against him, the French Military Authorities required Tom to live somewhere inland from the coast while they decided if Tom could be classified as unfit for military service and allowed to leave the country. He was sent to Uzès (Gard), about twenty kilometres north of Nimes, where Sue joined him a week later. Tom and Sue were kept under 'residence forcée et surveillée' at the Terminus Hotel, reporting to the local gendarmerie each day - this was later relaxed to once a week as the gendarmes took their lunchtime aperitifs at the Terminus and saw the Kennys there anyway. In May 1942 Emmanuel Martinez arranged for Tom and Sue to move closer to Cannes, at Valence (south of Lyons and on the rail link to Marseille). They stayed for two weeks at the Villa d'Athenes before moving into a small apartment in avenue Sadi Carnot. At the end of September they finally moved back to Cannes and again it was Emmanuel Martinez who arranged it. With Martinez as their guarantor, and with regular residence permits, they moved into Room 608 of the Hotel Martinez. Once back in Cannes, and with Emmanuel Martinez' consent, Tom soon established a rapport with Colonel Eric Sawyer, "chef des Services Secrets Britannique" and Cmdt Khan, "adjoint [assistant] au Colonel Vautrin, Cmdt la Region Militaire et chef du Reseau Francais". Sawyer, a long-term British resident in Nice, was involved with the arrival of two SOE agents at Cap d'Antibes and wanted Tom's help. NB. Brendan Murphy (Turncoat pg 85) says that the American Consul in Marseille, Hugh Fullerton, had heard that Sawyer had claimed to have been under pre-war orders from the British War Office never to allow himself to be repatriated. He also says Sawyer, who had been a banker, was the man who had delivered 850,000 francs (sic) sent from Switzerland, to Donald Caskie at the Seamen's Mission. Historic Note: MRD Foot (SOE in France pg 208) describes Col Vautrin as head of a local French counter-intelligence service and a friend of the Baron de Malval. He says "this friendship saved [SOE circuits] 'Urchin' and 'Spindle' from disaster several times". On 11 November 1942, the Germans moved into southern France. On 5 December 1942, Sue gave birth to Edward Patrick Kenny. It seems that Tom continued with his resistance work because on 10 December 1942, just five days after the birth of his first son, Tom says he left "le maquis" to say goodbye to his wife in Cannes. He explained to Emmanuel Martinez that he had been ordered to leave immediately for Gibraltar but that it would be impossible to take his wife and son with him. Martinez gave him an envelope containing 50,000 francs and a note saying "Bonne chance - A bientôt - Martinez". On 29 Dec 1942, T E Kenny made a highly detailed technical sketch of the docks at Marseille. On 11 Jan 1943, Tom Kenny crossed (illegally) into Spain. He reached Gibraltar, via Barcelona and Madrid, at the end of the month. In February 1943, Sue followed Tom to Spain. A guide named J K Trouvé collected Sue and baby Patrick and took them to Perpignan. They stayed the night in a hotel but when Sue woke in the morning, Trouvé had gone, and taken all her belongings with him. Sue and Patrick were saved by an Austrian officer in the German army who helped them to cross illegally. Sue, who was still only nineteen years old, was arrested in Spain and interrogated at Puigcerda before transfer to Figueras. She was only released when Capt P G H Dorchy, Vice-Consul in Barcelona, who had been expecting her arrival, learned where she was. She reached the British Consulate on 17 February and went on to Madrid on 8 March. On 24 March 1943, Sue and Patrick finally arrived at Gibraltar - just days after Tom had left for England. Sue's departure from Gibraltar was delayed when she was admitted to the Colonial hospital with German measles but she finally left the Rock in June. On board the ship to England she was reunited with her friend Nancy Fiocca. They arrived at Gourock on 17 June 1943. In December 1942, Nancy had been involved with the rescue of her friend Ian Garrow from Mauzac. When Pat O'Leary and Paul Ulmann were betrayed by the infiltrator Roger Leneveu and arrested in Toulouse on 2 March 1943, it was Nancy that went to Marseille to warn the rest of the Organisation. Within three weeks, most of the Marseille network had also been arrested and Nancy's days in France were numbered. By the end of the month, Françoise Dissard had arranged to have Nancy, Renée Nouveau, radio operator Philippe Valat and PAO courier Danielle Reddé taken across the mountains with a group of evading airmen. Nancy later joined SOE using her maiden name of Wake. In June 1943, Thomas E J Kenny was commissioned into the RAF and served with the RAF Intelligence Service for the rest of the war. Thomas Edward James Kenny died 10 February 1971 at Saint Cloud, France. At the time of writing (2006) Tom is survived by his wife Sue (Martinez) Kenny, who lives in Paris, and their three sons: Edward Patrick, also in Paris, Michael Phillip in Epsom, Surrey and John James of San Pere de Ribes, Barcelona.